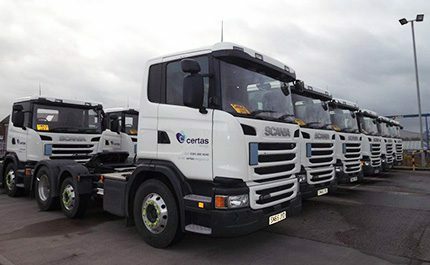 Twenty-one new Scania day cab tractor units fitted with the latest in-cab technology and tracking devices joined the Certas Energy fleet last month. “When it comes to replacing tankers, it’s our opportunity to ensure we introduce the best models available for our businesses needs while ensuring operational efficiency,” said head of fleet Glen Tyrie. The tractor units benefit from a lower GVW – a reduction by some 700kg – due to the use of a day-style cab. This allows the tanker to accommodate up to 36,500 litres, an increase of between 800 to 1,000 litres on a full load compared to the previous trucks. With Touchstar in cab technology customers have effective monitoring of each delivery and increased flow of data and information and the technology reduces in-house paperwork and also provides a useful platform for (certain) customers to view collection details and obtain delivery reports. Certas Energy will complete the ISO50001 Energy management systems accreditation process in 2016. This standard recognises companies that implement and maintain systems for improving energy management, by applying a systematic approach to continually improve energy performance of the business, while reducing energy use and costs.